Growing up, my parents taught me two things: be polite and don't play in the street. These two kids in Changde, China might know their Ps and Qs, but it looks like they didn't get the memo about playing in traffic. 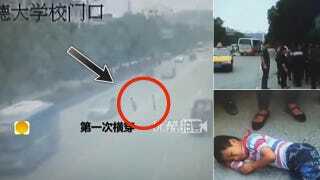 Out of what appears to be sheer boredom, the two young children sprint across a four lane road several times. It's like a real-life game of Frogger. The first three times were successful. But on the fourth attempt, a car hit one of the kids. Thankfully, the child survived and did not sustain life-threatening injuries—"just" multiple bruises and a broken hip. He's lucky to be alive. Don't play real-life Frogger. Play video game Frogger. It's safer.